November 11 is Veteran’s Day where many courageous men and women will be remembered, honored and celebrated for serving our country. The Town of Colma would like to invite any new residents to the Town of Colma who have served in our armed forces, and would like to be added to the Town’s Veteran’s recognition plaque, to please contact Recreation Manager Cynthia Morquecho at 650-985-5681 or cmorquecho@colma.ca.gov by October 26th so we can recognize you for your service to our country at the November 14, 2018 City Council meeting. The new Colma Town Hall at 1198 El Camino Real will be re-opened for business on Monday, September 10, 2018 and we celebrated with a Resident’s “Sneak Peek” Open House on Wednesday, September 26, 2018. If you missed the Open House or need to conduct Town business, please come by and say hello; please enter the parking lot from Serramonte Blvd and enter Town Hall through the new plaza. Don’t forget about all the wonderful Halloween events the Recreation Department has planned for this year. Please see the calendar on pager 2 and 3 or Town website at https://www.colma.ca.gov/departments/parks-recreation/ for information on the Pumpkin Carving Party, Halloween Parade, Teen Fright Night, and the Dia de los Muertos Event! Also, work on the new Sterling Park Playground is scheduled to begin in late September or early October. The project will include a newly expanded playground structure and picnic tables adjacent to the Recreation Center and a Fitness cluster just off the walking path near the grass area on E Street. We expect the project to be completed in December 2018. Just a reminder that there is a General Election on Tuesday, November 6th. On the ballot are two Colma City Council positions as well as Measure PP – Transit Occupancy Tax Initiative. Please visit the Town of Colma website at https://www.colma.ca.gov/town-of-colma-2018-general-municipal-election-information/ for more information. The lack of mental health crisis services across the U.S. has resulted in law enforcement officers serving as first responders to most crises. A Crisis Intervention Team (CIT) program, or Crisis Intervention Training is an innovative, community-based approach to improve the outcomes of these encounters. In recent years, the number of police -related calls for service involving persons with mental illness has increased. 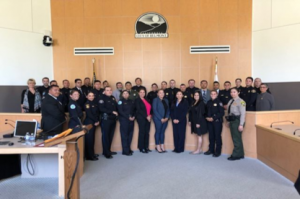 In response to this increase the Colma Police Department now has 80% of its sworn officers trained in Crisis Intervention, with two officers recently graduating from a week-long course hosted by the San Mateo County Sheriff’s Office. Our goal is to reach 100%. The 40-hour CIT training is comprised of classroom lectures on topics such as mental illness and substance use (and the relationship between the two), youth concerns/interventions, post-traumatic stress disorder, veteran’s issues, trauma, suicide, and county resources including the use of the San Mateo County Mental Health Assessment and Referral Team (SMART).